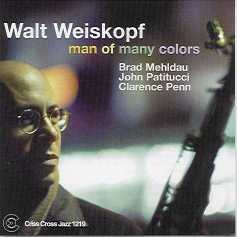 On Man of Many Colors, tenor saxophonist Walt Weiskopf - following a series of Criss Cross recordings featuring his original music for larger ensembles - places here the primary focus on his instrumental voice. Joined by star pianist Brad Mehldau, mega-bassist John Patitucci, and rising star drummer Clarence Penn, Weiskopf plays with characteristic surge, trampolining through the notes as though liberated from gravitational encumbrance. At all times he achieves the improviser's grail of telling a singular story.